Did you know that St Valentine’s remains are actually here in Dublin? I’ve visited them myself in Whitefriar’s Church on Aungier Street. On reflection, probably not the most romantic Valentine’s Day excursion I’ve ever had, but a lot more interesting than the norm. The day divides opinions and my own sentiments have changed throughout the years. These days I see it as an opportunity for a little bit of indulgence – whether that means self-gifted treats, or a wee gift from someone else. Here are a few ideas to get you started - if you fancy dropping a few hints, do email on the link! La Bougie launched on Valentine’s Day in 2011, so the date will always have special meaning for what’s fast becoming my favourite luxury candle brand. (Ssh, don’t tell Diptyque!). This year they’ve marked the occasion with the launch of the aromatic Dark Rose & Myrtle candle, inspired by sultry Mediterranean evenings. As with all their products, this comes in a hand carved glass jar, wrapped in scented tissue paper and tied with ivory grosgrain ribbon. Divine – and for what you get, quite reasonably priced too at €29.95 for 55 hrs burn time. You can buy from their website and yes, they ship internationally. Peeping out from behind the candle in the photo above is the prettiest bra I own – a vintage inspired balconnet style, with all-over embroidery and lace. It came courtesy of a new Irish site, the Dublin Lingerie Company (with whom I will very shortly be running a giveaway, so you can experience their gorgeous products and great customer service for yourself). What I like about the site is the wide range of sizes and shapes that they offer, to suit all figures and budgets. I chose the Elsa set by Panache, which comes in vintage ivory or black – it’s comfortable as well as gorgeous, and you can check it out here. Mr Fluff is a runner and suffers from aching muscles on a regular basis, so I love this Arnicare bath & massage balm from Nelson’s. It’s just €9.99 for a dual-purpose product which can surprise him with a massage or hot bath after his evening run (and there's always the possibility of a return on the favour sometime!). That adorable Sweet Tree is something else I know he’ll appreciate – pick it up in Avoca for €12.95, or check out Marks and Spencer’s fab range of heart-shaped chocolates and sweets. These last two items will score you no brownie points with your loved one – quite the opposite – but they could be handy if you have a hot date lined up tomorrow night. 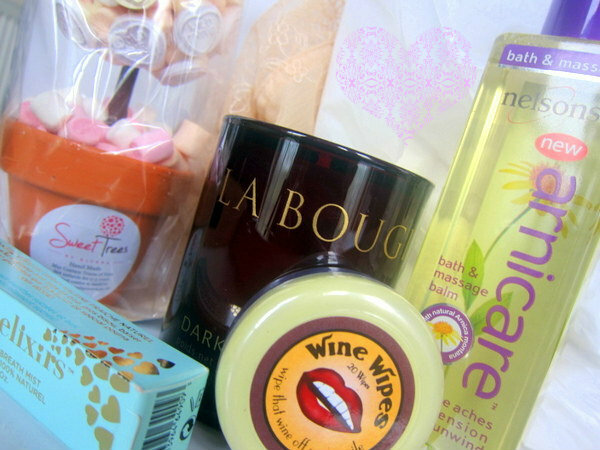 The Wine Wipes and Kissing Elixir arrived from Irish beauty emporium Mise Beauty – the wipes (€6.08) are saturated with all-natural hydrogen peroxide and baking soda to remove red wine staining from lips and teeth, and come with a handy mirror in the lid. The Kissing Elixir (€9.76) is the prettiest packaged breath spray I’ve encountered and the sugar-free, natural vanilla mint flavour is remarkably tasty. In case of emergency, both now live somewhere at the bottom of my handbag! What do you make of St. Valentine’s Day? Love it or loathe it? And do you do anything to mark the occasion? I love getting underwear as a gift. Its so hard to get right so when they do, it's a big deal. Total girlyness & prettiness! Love the kissing elixir! I'm not a fan of valentines day but I never say this for fear of sounding bitter - please don't judge me! Keeping my eyes peeled for that competition! 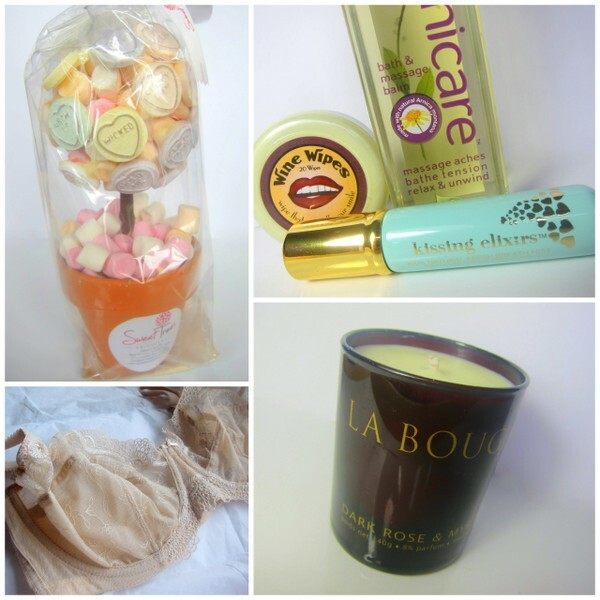 I don't celebrate V-day, but these lovely gift ideas would be perfect any time of the year! i've never tried la bougie candles. i'm going to cheat on diptyque too! hahahaha that sweet tree is right up my alley! All of the items in your picture are so pretty. I think all of them would be wonderful gifts. I don't have any plans for this Valentine's Day. And all though I do realize that Valentine's Day is a hallmark holiday the hopeless romantic in my loves any day that celebrates love.